Book 1 hotel & enjoy 5 - you will be spoiled for choice five times during your holidays at one of the Dolce Vita Hotels in South Tyrol. Enjoy five advantages at the Dolce Vita Hotels: Wellness Around, Music Around, Dinner Around, Fitness Around, and Culture Around. 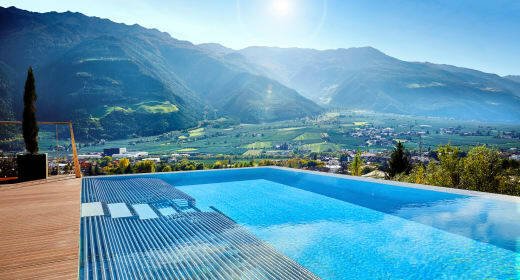 Dolce Vita Hotels: surrounded by majestic mountains the teams at the Dolce Vita Wellness Hotels in South Tyrol will give their best to ensure your perfect holiday. 'Give me Five': choose your favourite Dolce Vita Hotel and make it your 'base camp'. Explore the other Dolce Vita Spa Hotels in South Tyrol from your holiday residence - they all can be found within a radius of 30 kilometres. 'Give me Five'is your guarantee for limitless holiday fun. Avail yourself to the facilities and offers at all Dolce Vita Hotels - without any surcharge! Choose your favorite Dolce Vita Hotel and make it to your 'Base Camp'. From here you can conquer the other Dolce Vita Spa Hotels that are located within a radious of eleven kilometers. 'Give me Five' guarantees boundless holiday pleasure. You can use all the facilities and services of the four hotels Dolce Vita South Tyrol and to pay without spending a dime more. Enjoy the freedome to choose `from` a wide variety of ways in the various Dolce Vita Resorts. Ideal for romance, wellness and couples. For families and spa highly recommended. The Design & Spa Hotel Sport for sporty people. Active hotel for mountainbiking and sports. Enjoy relaxation to the fullest as a guest of a Dolce Vita Hotel in Naturno or Latsch. Your hotels in South Tyrol have prepared musical delights for you on five evenings every week. Book one hotel and treat yourself to the cuisines of different hotel restaurants. Spend your holidays at one of thr Dolce Vita Hotels and profit `from` numerous fitness offers `from` all hotels. Explore the Vinschgau Valley, picturesque Merano and your holiday resorts Naturno and Latsch. Enjoy the liberty to choose `from` a wide range of amenities at the different Dolce Vita Resorts. Would you love to go out for dinner? 'Dinner Around' grants you access to all restaurants at Dolce Vita partner hotels. The wellness & spa areas at the Dolce Vita Hotels invite you to relax and forget the world around you. Why not try out the wellness & spa facilities of all hotels and wellness & spa treatments `from` continents with 'Wellness Around'. Enjoy a diversity of musical delights with 'Music Around' - and indulge in cultural events with 'Culture Around'. 'Fitness Around' - Would you like to face sports challenges? You will certainly find suitable sports opportunities at one of the Dolce Vita Hotels. Let a fitness trainer at your hotel advise you, or pay a neighbouring Dolce Vita Hotel a visit.